Fall and winter mean gloves, hats, thick coats and yummy flavors like cranberry and cloves. Whip up this Shakeology smoothie up and you can enjoy the coziness of the season without straying from your nutrition goals. All you need are three ingredients (minus the water and ice!) and you’ve got a shaker bottle of healthy, delicious goodness in your hand! 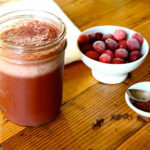 This cranberry smoothie is great for winter months! Place water, cranberry juice, Shakeology, cloves, and ice in blender; cover. Blend until smooth.